ALAA maintains two union caucuses to serve the interests of our diverse membership. The Attorneys of Color at Legal Aid Caucus (ACLA) was founded in 1990 by staff attorneys of color from the Criminal, Civil, and Volunteer divisions, together with the Executive Director and the President of ALAA,primarily to address the dismal record of hiring and retaining attorneys of color throughout the society. Provide mandatory diversity training for staff and supervisors in the areas of race, gender, and sexual orientation. 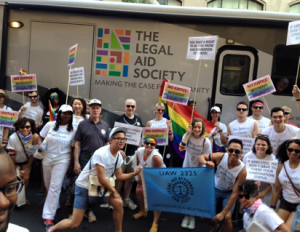 The LGBTQ Caucus of The Association of Legal Aid Attorneys/UAW Local 2325 (ALAA) was founded by attorneys within the Legal Aid Society to support LGBTQ attorneys. The goal of The LGBTQ Caucus is to help empower LGBTQ members, clients and communities at large. We work closely with the Attorneys of Color Caucus to improve recruitment and retention of LGBTQ attorneys, as well as on other initiatives to address bias in the workplace, cultural competency and other LGBTQ rights and racial justice issues. We have representation on our union’s executive board, the Association of Legal Aid Attorneys. Through the bargaining process and beyond, the Caucus has improved our collective bargaining agreement and workplace conditions. Additionally, we host gatherings for staff, interns and community partners, participate in Know your Rights trainings, Pride celebrations, and more. Our members are actively involved in a number of coalitions, campaigns and organizing efforts. In recent years, the LGBTQ Caucus has expanded its community outreach efforts with transgender/GNC communities of color, including at the annual Trans Day of Action. We also work with Legal Aid’s LGBT Law and Policy initiative to help educate New Yorkers, lobby for reform and bring necessary litigation to support LGBTQ New Yorkers. We welcome all LGBTQ LAS attorneys to participate in the LGBTQ Caucus, plan future activities, and get your input. We currently maintain a listserv for our Caucus members, if you’d like to be added please email: Jared Trujillo, JTrujillo@legal-aid.org & Rage Kidvai, RKidvai@legal-aid.org. The Black Attorneys of Legal Aid Caucus was founded in 2017 to amplify the voice and particular issues faced by Black attorneys working at the Legal Aid Society. Black lawyers have played an integral role in Legal Aid’s pursuit of its mission to provide quality representation to low-income and underrepresented individuals in New York City. 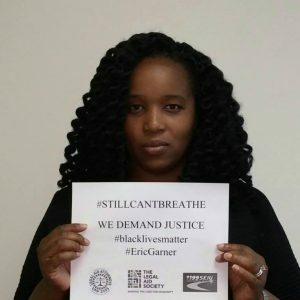 We have been staunch advocates for just outcomes for our clients, which has required that we battle against the social injustices and institutionalized racism that have an overarching dictate on the lives and trajectories of our clients. Simultaneously, black attorneys have had to engage in an ongoing effort to ensure that we are being equally recognized at Legal Aid, valued in the same way as our colleagues and not targeted or treated in a disparate manner. Moreover, black attorneys have had to take up the responsibility of making sure that we and attorneys of color at large are recruited and retained by Legal Aid.